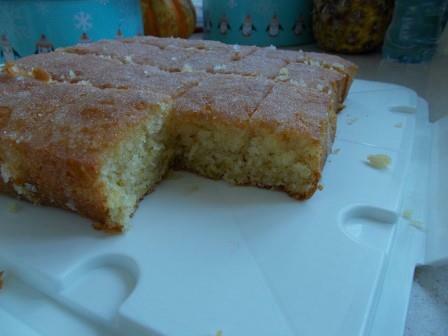 Lemon Drizzle cake – Mary Berry recipe | what? bread? This may be the shortest blog I’ll write. 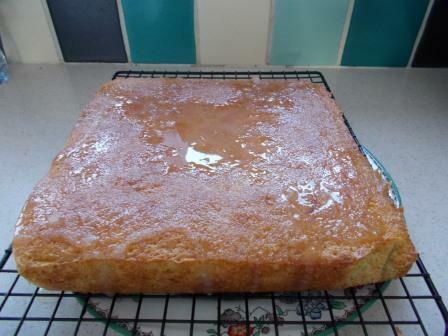 A little while ago before she became the face of BBC’s Great British Bake-Off, Mary flirted with UKTV and this lemon drizzle cake recipe is on their website. A four egg recipe is a bit much for us, so I cut it down to three eggs and use a square pan to bake it. Today I only had one lemon, but used a fine microplane grater to get the zest off and heated the lemon in the microwave oven for 30 seconds to make sure I had got out as much juice as possible. A nice quick recipe, you can just bung all the ingredients in together and give it a good seeing to for a couple of minutes, or do it in stages. So we have butter, sugar, eggs, flour, baking powder and lemon zest. 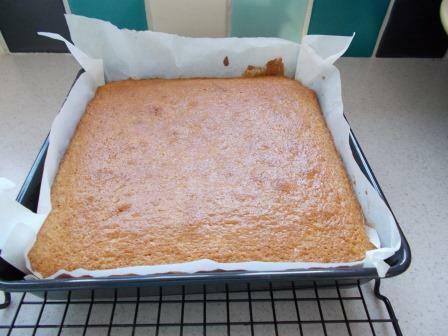 With a topping of granulated sugar and lemon juice. So simple I don’t know why I don’t make it more often. Pingback: Sticky lemon and poppy seed cake | what? bread?